As Bursar, Caroline Purdom is responsible for day to day operations at Davenies School, a prep school for boys in Beaconsfield, Buckinghamshire. One of her many concerns is to ensure that finances are utilised in the most efficient manner in support of excellent teaching and learning. Caroline met with Expense Reduction Analysts UK’s (ERA UK) Client Manager and Project Specialist, Chris Wardle, in what was to be the start of a five-year long working partnership. 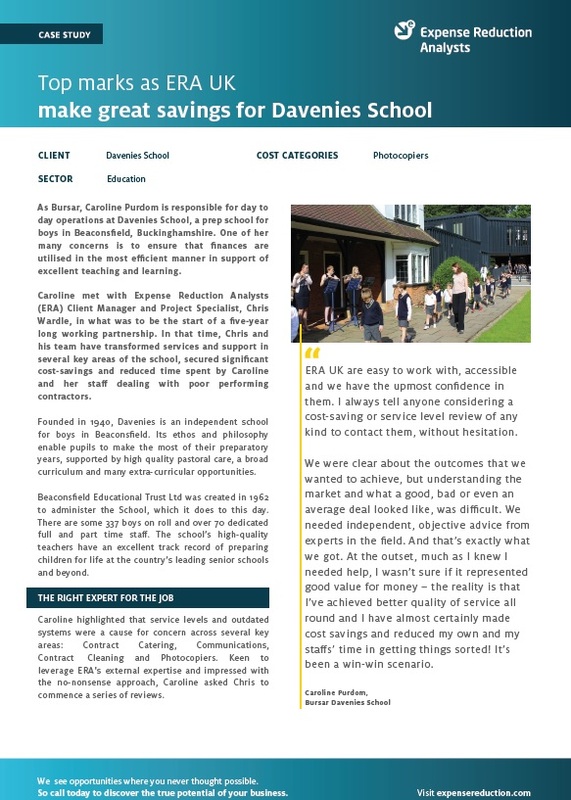 In that time, Chris and his team have transformed services and support in several key areas of the school, secured significant cost-savings and reduced time spent by Caroline and her staff dealing with poor performing contractors. To find out more about how ERA helped the Davenies School, including results, savings and more details from the client, download the full case study now.